Five villagers arbitrarily arrested in September 2016 during protests against a Jiuxing Mines gold mining project located 70km west of the Malagasy capital Antananarivo have finally been released after repeated calls that they be freed. The trial eventually took place a few days after the UN Human Rights rapporteur took up the issue of the villagers’ arrests in the preliminary report on his recent visit to Madagascar. All five villagers received a one year suspended jail sentence for unauthorized demonstration but were acquitted on other charges. 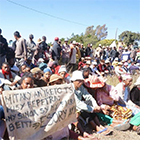 Protests in the town of Soamahamanina led to the Malagasy government halting the mining project in July, but villagers continue to request cancellation of the mining permit and the company’s definite departure. The struggle for these demands continues!